Revolutionary new mold remediation technology, based on recently declassified government research. Once applied, extremely safe to people, pets, fabrics, leather, plastics, and electronics. Kills all bacteria, viruses, mold, black mold, toxic mold and mildew (including mold spores) on contact. 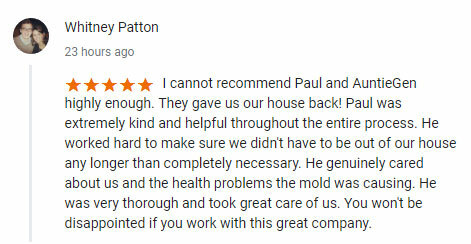 Mold remediation is an industry where most mold remediation companies today use 30 year old technology to combat mold. 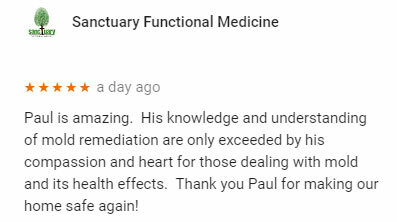 Our product remediates and eliminates the antigen of the mold spore; (The immune system reacts when special substances called “antigens” enter the body. Antigens are usually found on germs such as infectious bacteria or viruses. The immune system reacts to neutralize these germs and prevent infections. Antigens are also found on harmless material such as mold spores) we will explain how we can simultaneously eliminate many other health threats with this same application. 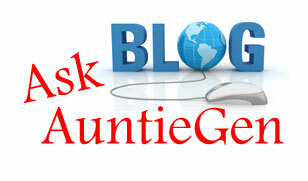 AuntieGen provides a written warranty and we stand behind our work. 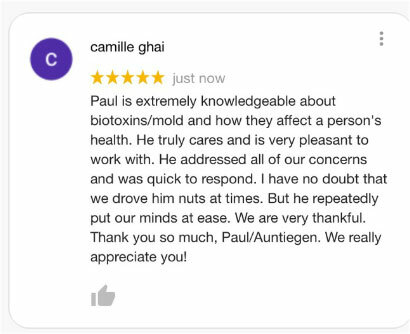 EPA registered, AuntieGen is approved for porous surfaces, with special technology to penetrate and treat even the most porous materials. Neutralizes odors, everything from smoke to off-gassing of paints, stains, and other building products. 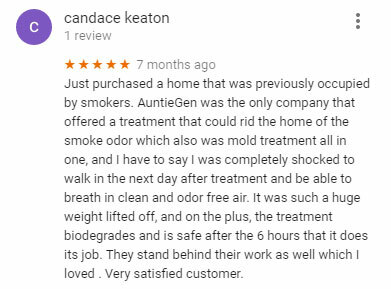 On both hard and soft surfaces, from walls and counters to carpets, upholstery, and drapes, AuntieGen eliminates mold, sterilizes, and treats against future mold growth all in one step. Extremely cost-effective for new construction as it can protect the builder from future claims, while protecting their customers checkbooks. 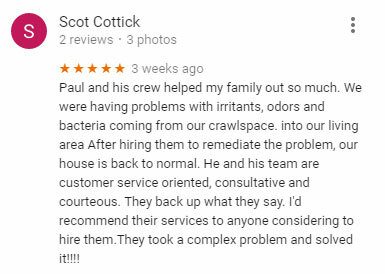 In addition our product and service has a greater scope beyond mold remediation. 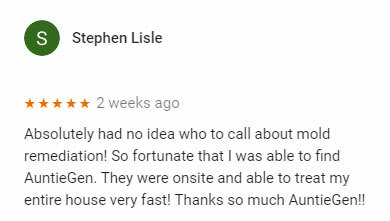 A key market need that is also addressed by our business is the decontamination of Drug Houses, (Meth Labs) Crime Scene Clean up and Air Duct Decontamination. 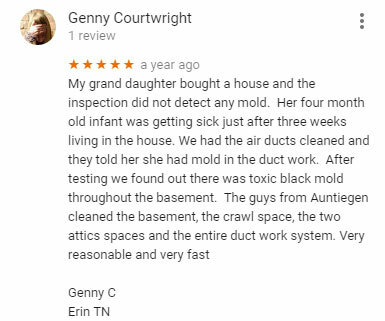 AuntieGen is committed to keeping you safe and healthy in your home and in your communities. We provide protection and services for Residential Buildings, Commercial Sites, Industrial Facilities, Public & Private Institutions, Schools, Health Care Facilities, Property Management Companies, New Building Construction Sites, Commercial Fleets Including Ships and Aircraft. 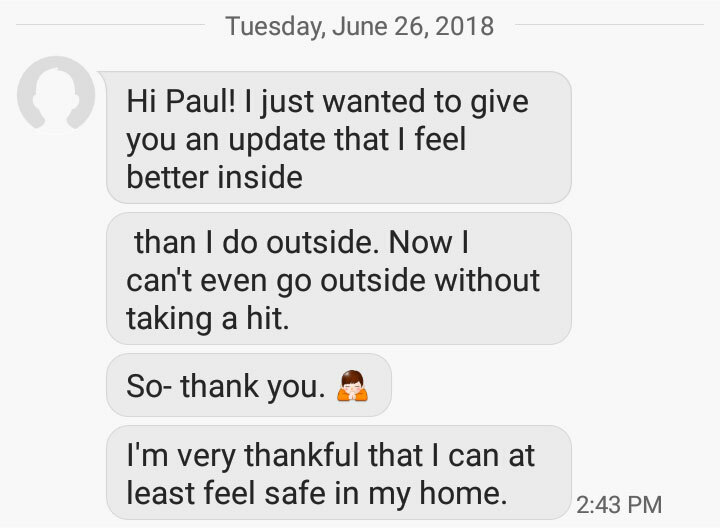 The mission of AuntieGen, Inc. is to create healthier living areas for our families, cure sick building syndrome for our students and employees by annihilating all infectious living and toxic organisms. We achieve this through our product that becomes Bio-degradable . 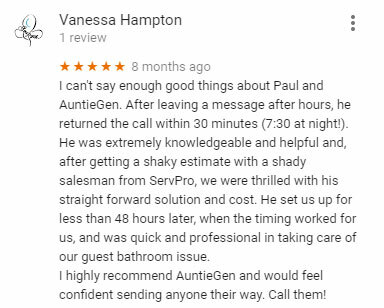 Put it all together and AuntieGen eliminates the need for many services and provides a complete solution for homes and businesses alike. 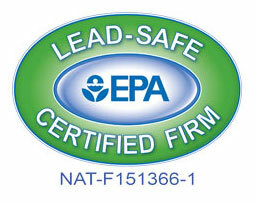 Radon is responsible for about 21,000 lung cancer deaths each year in the United States. This time of year, many people are spending a lot more time indoors. With windows and doors shut tight, you could be putting your family at risk for radon poisoning. Radon is responsible for about 21,000 lung cancer deaths each year in the United States. Radon comes from the breakdown of uranium in rocks and soil. It’s a radioactive gas in the air we breathe, but it becomes unsafe when the gasses are trapped indoors. It’s a hidden danger that could be in your home and why officials want residents to find out if they are affected. “It is an odorless, colorless gas and it has no taste so short of testing for it there is no way to know whether or not there’s an issue,” said Sabrina Novak, with the Chattanooga-Hamilton County Health Department. “It enters the home through cracks and openings, and all homes regardless of age, energy-efficiency, or foundation type are at risk. The only way to know is to test that home,” she explained. A device inside Kyle Stephens’ home offers his family peace of mind. “We have a two-year-old and one on the way and we want to make sure those growing lungs didn’t have any exposure to radon,” Stephens said.Radon occurs in every county in Tennessee with Hamilton County specifically at a moderate risk. What is black mold? 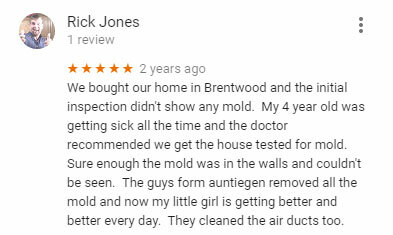 Black mold is a type of fungus that is very dark green or black and often has a distinct musty or damp, mildewy smell. Black mold can be one of several different species of fungus, including Stachybotrys chartum. It tends to grow on surfaces that contain a lot of cellulose, such as fiberboard, wood, gypsum board, or paper. The mold prefers damp, warm environments, and it can grow wherever the conditions are right. Mold in your home can make you physically ill. While it’s often visible when there is an infestation, mold can be lurking behind damp walls or under water-damaged flooring. Toxic mold exposure is on the rise, and most people aren’t even aware they’re at risk, according to experts. “There are millions of people suffering from mold toxicity that don’t know it because it’s going majorly undiagnosed,” said Dr. Neil Nathan, a Board Certified Family Physician and author of the book “Toxic” (Victory Belt Publishing). Mold, which releases mycotoxins in the air due to water damage, is often invisible with the naked eye, but dangerous to those with toxin sensitivities. Nathan said not everyone who is exposed to mold gets sick. 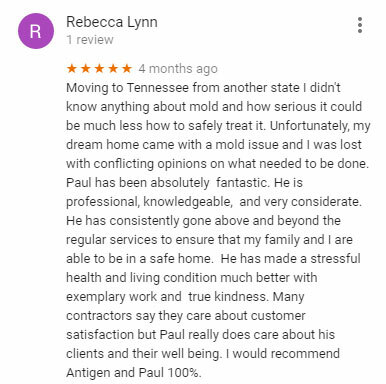 NASHVILLE, Tenn. (WZTV) — Some people living in a Madison apartment complex claim they have been dealing with mold and leaky ceilings for years. It’s a problem some residents of the Highland Ridge Apartments say is now making them worried for their kids. FOX 17 News was invited into some of these homes and saw the mold and cracks firsthand. After investigating, we learned these problems started years ago. New management took over the complex in July. They tell us they have been cleaning up the mess they inherited since then. FOX 17 News talked to two families on the condition they would remain anonymous. Neither family wants to lose their home. One of those families is a family of six. They have lived in their apartment for three years. They say for them, the issues started when they first moved into the complex. “When we first moved in, I complained about the mold,” the mother of four tells us. She showed FOX 17 News mold on her ceilings, walls, and an area she said leaked after a thunderstorm last year. 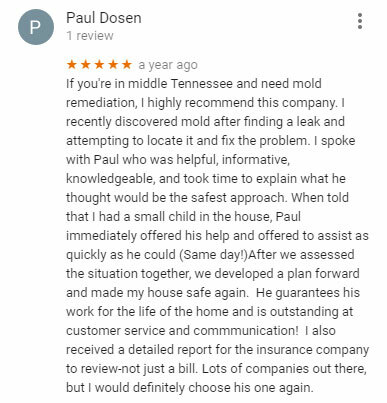 “There’s mold everywhere”. Nashville Fire Department personnel have been relocated from one station after active mold spores were found in the fire hall. Staff at Station 24, 3851 Clarksville Highway, have been temporarily moved to other stations while a remediation plan is put in place and completed. “Personnel assigned to Station 24 alerted supervisors that they believe they found mold in the fire hall,” NFD spokesperson Joseph Pleasant said in a release. The NFD safety office confirmed the report and began investigating. A verbal confirmation of the mold from a contractor led to the immediate relocation of personnel.